Hotspot Shield 3.37 تحميل برنامج هوت سبوت شيلد هو برنامج لفتح المواقع المحجوبة أو المواقع المحظورة وتجوز مراقبة مزود الخدمة لديك . يمكنك مع برنامج Hotspot Shield هوت سبوت فتح اي موقع محجوب وفتح اي بريد او دردشة او موقع محظور سوء مواقع سياسية محظورة او مواقع رياضية . تحميل برنامج هوت سبوت وطبعاً نتمنى ان لايحمل البرنامج شخص يريد فتح موقع جنس او موقع يحارب الاسلام والمسلمين . هذا الاصدار افضل من غيره من برامج فتح المواقع المحجوبة على موقعنا . 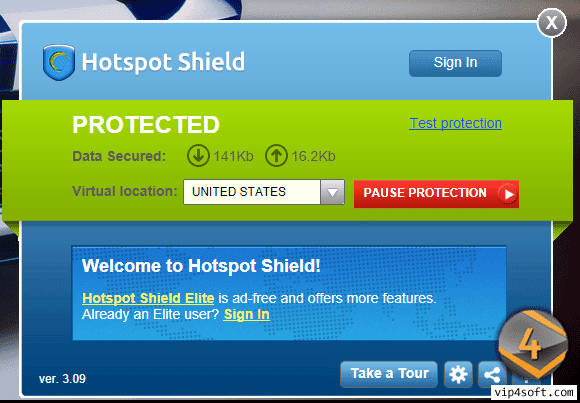 Hotspot Shield is a software solution that adds a supplemental protection layer to your computer, as it has the necessary features to secure a Wi-Fi and a wired connection even in public places. The application actually protects the data transfers, so every bit you send and receive when connected to a certain network will be encrypted, no matter if it is personal information, bank accounts or any other type of private details. The installation procedure is rather straightforward, but you will have to look carefully at each prompt if you want to avoid the third party software it comes bundled with. On the other hand, Hotspot Shield remains very friendly with computer resources all the time, which means you should be able to run it on older machines as well.